Smart Allergy Friendly Education: ATTENTION: Jelly Belly Candy Corn Repost - NOT TREE-NUT FREE but IT IS Gluten-Free, Milk-Free, Egg-Free, PEANUT- Free! 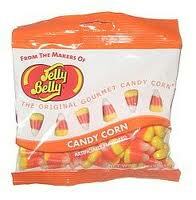 ATTENTION: Jelly Belly Candy Corn Repost - NOT TREE-NUT FREE but IT IS Gluten-Free, Milk-Free, Egg-Free, PEANUT- Free! Yesterday I posted a blog about a candy corn I am hoping to try out for the Halloween season which I was informed was gluten-free, milk-free, egg-free, peanut-free and NUT-free. Turns out they are gluten-free, milk-free, egg-free and peanut-free but NOT guaranteed to be TREE NUT-FREE. An important clarification for those of us managing tree-nut allergies. I commend the Consumer Affairs department for getting back to me so quickly so that I can share update to date and correct information. This blog is a bit long but I thought it was important to have all of the CORRECT INFO in one place. For this reason, I am reposting this blog with some important clarifications per speaking with Kit McCoy, a Consumer Affairs Manager, with Jelly Belly. She profusely apologized for any errors in the information previously sent to me. These candy corn are gluten-free, milk-free, egg-free, AND peanut-free due to the fact that Jelly Belly is now PEANUT FREE. All Confections by this particular company are certified OU Kosher by the Orthodox Union, including these candy corn. Unfortunately, they do contain modified soy protein. Jelly Belly Candy Corn! Yes, from the makers of the well known gourmet jelly beans, Jelly Belly. 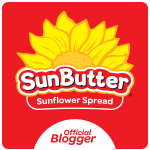 Ingredients include: SUGAR, CORN SYRUP, CONTAINS 2% OR LESS OF THE FOLLOWING: MODIFIED SOY PROTEIN, ARTIFICIAL FLAVOR, SORBITOL, COLOR ADDED, YELLOW 6 LAKE, YELLOW 5, RED 3, BEESWAX, CARNAUBA WAX, CONFECTIONER'S GLAZE, SALT. As I haven't tried these out yet... I can't even seem to find them locally, I don't have and can't find a specific ingredient list for the candy corn. You can order them online. Their webpage is great. In addition to typical links, it also a VISITOR CENTER detailing information regarding their facilities, FUN STUFF which includes coloring pages for kids, IDEAS for baking and decorating during special occasions/holidays. It appears there had been a VERY recent change of using MODIFIED SOY PROTEIN in place of the SOY LECITHIN, as in a two day change! I have made those changes throughout this blog. The candy corn is NOT considered to be 100% nut-free. They do NOT use tree nuts in the manufacturing process, HOWEVER, (as is stated below) Candy Corn is made on the same line as our Coconut Jelly Belly flavor and is Polished on the same equipment in panning with milk containing chocolate and wheat (licorice centers) and nuts (almonds, pecans, walnuts and cashews). We pack them on the same equipment as Chocolate Malt Balls, Chocolate Raisins, chocolate nuts, Licorice Pastels. I had asked for clarification regarding, whether Jelly Belly could could say “Our Candy Corn is gluten free, dairy free, peanut free, and nut free” since it shares equipment. Per Kit: They are definitely “peanut free” because we do not manufacture peanuts in our factory. Candy Corn does not include dairy, gluten or nuts in the recipe. However, Candy Corn shares the same polishing and packaging equipment as candy with these allergens. Our allergen policy is stringent and we follow Good Manufacturing Practices. Any equipment, tray or utensil used for any product contain an allergen is tagged with an "allergen tag". Everything is thoroughly cleaned and documented in an allergen log and must be inspected and signed off by a supervisor prior to the next use. A Quality Assurance technician checks against production schedule to assure that all cleaning/reports were done. All Jelly Belly Candy Company employees working in the factory have yearly allergen training during the plant shutdown. Do some of your remember eating peanut butter flavored jelly beans in the past? Well, Jelly Belly stopped manufacturing PEANUT jelly beans/products on June 26, 2009. The shelf life for these products is two years. What does this mean for you and I? Although it is highly unlikely, there could be a stray bag or two of jelly beans containing a peanut butter jelly bean so be sure to read the labels to make sure you don't have an OUT OF DATE bag. Tomi Holt from Media Relations ensured me these items are EGG-FREE as this labeling doesn't seem to be available. Of course, I suggested they add this information to appeal to the many of us managing this particular allergy. This is information from the initial email response I received from Scott, with Consumer Affairs with the information corrected. I highlighted certain areas I thought would be of particular interest. 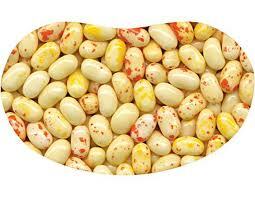 Thank you for your interest in our Jelly Belly Candy Corn. Our Candy Corn is gluten free, egg free, dairy free, AND peanut free. It is also "OU Kosher" certified. It does contain MODIFIED SOY PROTEIN. The Candy Corn is made on the same line as our Coconut Jelly Belly flavor and is Polished on the same equipment in panning with milk containing chocolate and wheat (licorice centers) and nuts (almonds, pecans, walnuts and cashews). We pack them on the same equipment as Chocolate Malt Balls, Chocolate Raisins, chocolate nuts, Licorice Pastels. Since you mentioned your children have food allergies, we have included information about all of our allergens. We do not manufacture any peanut products in our plant; however, we do chocolate cover whole almonds, pecans, walnuts and cashews and we use real coconut in our Coconut Jelly Belly flavor. We currently have two candies with gluten made with either malt centers or licorice centers. We do not manufacture these centers; we purchase from another manufacturer. We then coat the malt centers with either chocolate or a candy shell. We cover the Licorice centers with a hard candy shell. Our chocolate and mellocreme candies, including Candy Corn contain modified soy protein. We follow good manufacturing practices and have a stringent allergen policy to prevent cross-contamination. Any equipment used to process a product containing an allergen must be thoroughly cleaned and inspected by a supervisor prior to the next use. If you contact Jelly Belly, they will be glad to send you their full allergen list. It's very helpful. The only nut on the list is COCONUT. Thank you to the personnel for paying attention and wanting to put out the CORRECT information about your labeling. For those of us in the allergy world, it means a lot. Even I, an allergy parent, make mistakes sometimes. Thank you Kit, Tomi and Scott for doing your best to help us keep all of our allergy kids safe!! I almost forgot to mention they also have Candy Corn Jelly Beans! Will need to check those out too! I have one last local store to call to see if they have these. If they don't, I'll be ordering to ensure I have them by next Wednesday's baking class! Can't wait to see the look on my son's face when he can eat what everyone else is eating! That always make for a wonderful day! Happy Halloween and Happy Hunting for Holiday Treats!!! Teresa, this has to be a personal call on your part. I would probably stay away from them. 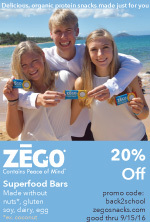 Try Gimbals and/or surf sweets as an alternative.